I am so pleased with how this dessert came out - it could have gone so wrong! I just imagined the cake splitting and falling apart when I turned it out and when I rolled it up, but success - everything went perfectly. 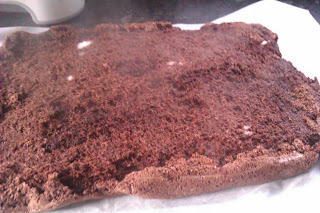 The only thing that would have made it better would have been having icing sugar to dust the top off for a 'snow' effect, but unfortunately (or maybe fortunately, considering how lumpy it was) it has run out and since it's the end of term and I'm low on money I didn't want to buy any more. I made this as the dessert for my house Christmas meal, which we had last night and was awesome! I was more full than I can ever remember being afterwards, but it was totally worth it. Unfortunately E couldn't make it, but the rest of us had a great time making and eating it; we even bought crackers (I didn't win once) and earlier in the evening I got to listen to the Frank Sinatra Christmas record that I brought back with me from Liverpool. Overall, a great evening. Shockingly, the sponge for the chocolate log is made from nothing but egg, sugar and cocoa. I was surprised that there was no flour or even ground almonds, but the sponge that resulted from the recipe (taken from Delia Smith's prune and Armagnac chocolate log) was wonderfully light and made the cake that much better. I used Swiss buttercream for the filling and made a chocolate ganache for the topping. 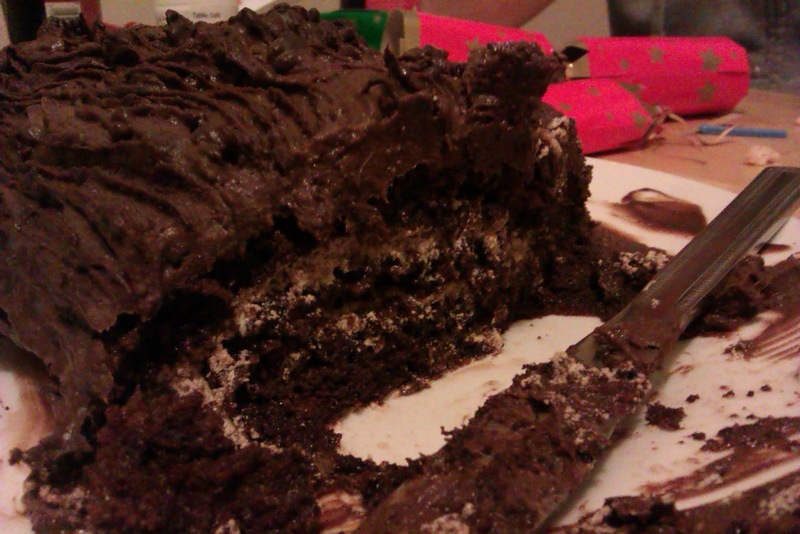 This cake is amazing, and deserves to be on any Christmas table. Some holly might have been a nice finishing touch, too, but I have yet to see a single holly bush in Newcastle. I did consider going and getting some leaves off the streets, but I don't really want pavement leaves touching my nice cake. Last week's sweet potato pie was compared by my housemates to egg custard tart, which I think was due to the nutmeg. Everybody seemed to like it and it did go fairly quickly, but I made donuts for N's 21st on Sunday, which understandably took the limelight from the pie. 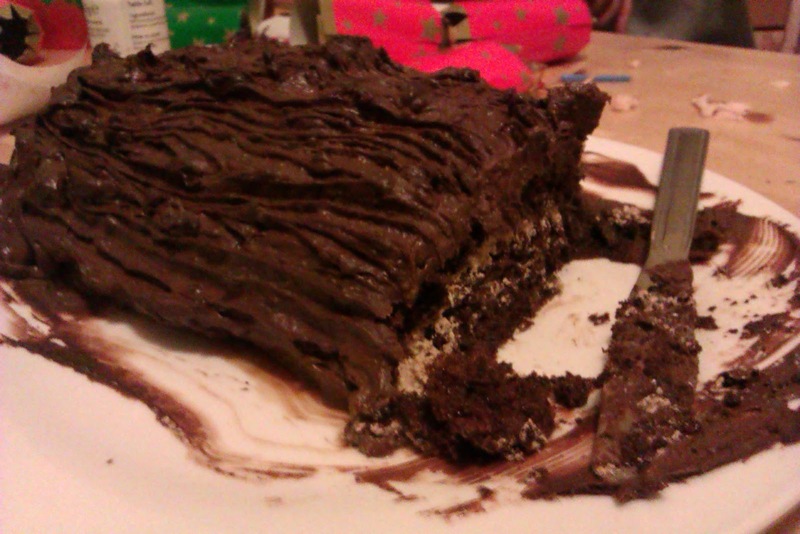 Nevertheless, I was very pleased with it and it was so easy to make that I'll definitely use it as a fallback recipe. 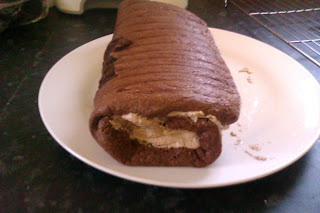 Everybody has already proclaimed the chocolate log as a winner, so I expect it to disappear pretty sharpish. Try one yourself; you won't be disappointed. Preheat the oven to 180C and line a roasting tin/Swiss roll tin with baking parchment. In a bowl, whisk the egg yolks together and then add the caster sugar, whisking until it thickens. Stir in the cocoa powder until everything is well combined. Gently fold the egg whites into the egg yolk mixture using a metal tablespoon. When they are completely combined, pour the mixture into the baking tin and cook for 20 mins/18 mins fan. Take a cooling rack and place a sheet of baking parchment over the top. Carefully invert the cooling rack and baking parchment over the baking tray and (wearing oven gloves!) flip them over while keeping them together. Now remove the baking tray and the sponge should now be on the cooling rack. While the sponge is cooking, prepare the Swiss buttercream. Separate the eggs and put the egg yolks in a container for storage. Put the egg whites in a small bowl that will fit over a saucepan, and stir them into the sugar. Cut up the butter into small pieces and then, one piece at a time, whisk it into the meringue. The mixture will now be quite runny: Whisk Kid says that if you keep whisking it will become more solid, or if not to put it in the fridge for a bit and then try again, but I can't seem to move past the runny stage. It doesn't matter; runny worked fine in this recipe. Spread the buttercream over the sponge using a spatula. Carefully roll the sponge up, pulling the baking parchment underneath up and along to help to guide it and stop you ripping the cake. Next, melt the chocolate in a saucepan and pour in the cream. Stir to combine, then allow to cool and put the ganache in the fridge until it is solid enough to spread over the cake. Dollop the ganache onto the cake and spread it over the sides and ends using a spatula. Let it set a little bit, then use a fork to carve 'wood' patterns in the topping. Dust some icing sugar over the cake to finish (if you have it). If you don't understand what some or the jargon used above means, go to The Basics, where I have also added some pictures of soft and stiff peaks. Next weekend I'm going home, so you won't hear from me until a bit later than usual, but then I expect there'll be at least one rave about pasties and cream teas, too.